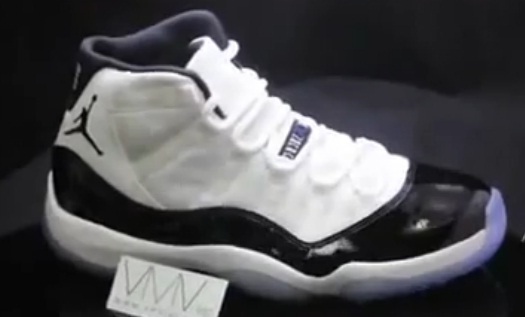 After images first surfaced earlier this week, we now have a video giving us an all-around look at the 2011 Air Jordan Retro 11 'Concord." Earlier this week one of the many sites known to offer Air Jordan Retro releases incredibly early hit us with our first look at this year's release of the "Concord" Air Jordan Retro 11. Immediately many out there were quick to question the authenticity of their images, claiming they were photoshopped or "pieced together." Proving those doubters wrong, VMVinc recently released this video giving us a 360-view of what is indeed the 2011 "Concord" Air Jordan Retro 11. Blue-tinted outsoles are still present, but of course they do not appear as bright in video. Either way, we can now put all speculatation to rest as we offically have our first look at the 2011 "Concord" Air Jordan Retro 11 thanks to VMVinc.